With NAB just around the corner, it’s time to start planning your schedule. To make your life easier, SCN has compiled some of the notable new pro AV products at the show so you can easily add them to your map. Audio-Technica will showcase its 3000 Series UHF Wireless Systems, its fourth-generation 3000 Series wireless system, which provides easy setup, versatile operation, and dependable, high-fidelity sound. Featuring a 60 MHz tuning bandwidth, 300-foot operating range and selectable backup frequency, the new 3000 Series offers the power and flexibility to operate within the congested UHF spectrum. It is available in multiple configurations, with handheld and body-pack transmitters. Leyard and Planar will focus on its TWS Series, a family of ultra-fine pitch LED video wall displays with a convenient 27-inch diagonal size. Light weight and easy to handle, the all-in-one design allows it meet the widest range of application requirements, offering an attractive solution for faceted curved video walls, hanging video walls, or standard video wall environments that require a compact, fine pixel pitch solution. Blackmagic Design is showing off its ATEM 4 M/E Broadcast Studio 4K is a new, advanced high frame rate Ultra HD 2160p60 switcher with 20 inputs, 4 M/Es, and a massive 16 next generation ATEM Advanced Chroma Keyers. It features two Ultra HD multi viewers, full 2D DVE, and built-in SuperSource compositing engines. Genelec is focused on its 8351, 8341 and 8331, small three-way coaxial monitors that, together, create a complete compact coaxial range, The Ones, designed to redefine near-field monitoring. According to Genelec, these products wipe away the previous constraints of coaxial point source setups. With The Ones, ultimate point source meets ultimate flexibility with Smart Active Monitoring, the proprietary technology based on Genelec Loudspeaker Manager 3.0 software for PC and Mac, incorporating AutoCal. Epson is showcasing several solutions for delivering vibrant, creative content, including its recently announced laser projectors and interactive display series, as well as new software for managing multiple projectors simultaneously to facilitate advanced techniques such as projector mapping. Focusrite will be displaying the Red and RedNet ranges of Dante audio-over-IP devices, featuring high-quality digital conversion, remote-controlled preamps and connectivity including MADI, Pro Tools | HD, AES3, and Thunderbolt. New at the show this year is the RedNet X2P, a compact 2x2 Dante interface. DiGiCo’s 4REA4 Installed Audio Solution will make its North American debut at NAB. Designed to meet the expanding performance requirements of large broadcast facilities, entertainment venues, and houses of worship, the product features 128 input channels and 48 buss output processing strips, allowing the user to independently allocate processing to whichever area is required. Roland will feature its 1U Rackmount XS-62S Switcher, ideal for streaming, live events, and education. 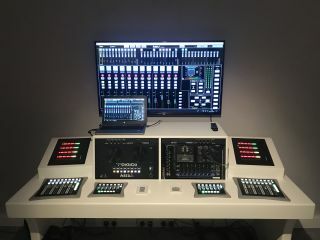 It has four SDI and two scaled HDMI inputs for data, computer, tablet, etc., plus a program and independent Aux bus for confidence and downstage monitors, or side screens. It also contains an integrated audio plus PTZ camera control using 422 VISCA. VITEC will be showing its newly upgraded EZ TV IPTV and Digital Signage Platform, which can now manage and drive complex video wall setups. The system is interoperable with the latest content protection, and meets stringent DRM standards. EZ TV simplifies IPTV, digital signage, and video wall content installs, while delivering an eye-catching visual experience. tvONE will showcase the company's fastest, most intuitive 4K multi-window processor with up to eight sources—the new CORIOview 4K multi-window processor. The 1/2RU unit allows for each of its eight inputs to be viewed in any of the eight video windows with ultra-low latency. CORIOview supports mixed input types, color borders, and source labeling. Additionally, it supports source and preset transitions, offers landscape and portrait output options for displays, and is LED wall capable with custom resolution management.